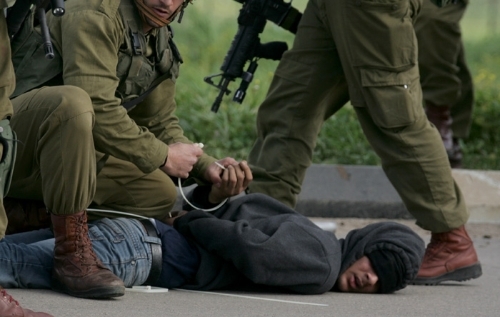 Monday [October 7, 2013] Israeli soldiers invaded the Beit Ummar and Ithna towns, near the southern West Bank city of Hebron, and kidnapped three Palestinians. Army also ordered removal of solar panels in small village. The Palestinian News & Info Agency (WAFA) has reported that the army invaded Ithna, west of Hebron, broke into and searched several homes, and kidnapped Ismael Talab Nattah, 28. Soldiers also invaded Beit Ummar towns, north of Hebron, and kidnapped Myassar Sadeq Abu Maria, 28, and Mahmoud Mohammad Awad, 26. Furthermore, Rateb Jabour, coordinator of the Popular Committee against the Wall and Settlements in Hebron, stated that dozens of soldiers invaded Lasfa area, near Yatta, and handed the residents military warrants ordering them to remove their solar panels. Jabour added that the village, is one of eight villages Israeli wants to destroy in the area, as the villages are not recognize by the Civil Administration officer run the the Israeli military occupying Palestine. On Sunday evening, soldiers invaded Azzoun Atma town, near the northern West Bank city of Qalqilia, and kidnapped four children. Several Palestinians have also been kidnapped on Sunday night and on Monday at dawn, in Jerusalem, Jenin and Bethlehem. On Monday morning, Israeli occupation forces ordered six Palestinian families to stop construction on their homes in the northern Jordan Valley, and instead, to demolish them. Aref Daraghmeh, Head of The village council of al-Maleh and al-Madareb, said that Israeli forces and Civil Administration, headed to al-Mentar area in the Jordan Valley and handed its residents notices to stop the construction of a number of barracks they were building and start to demolish them. 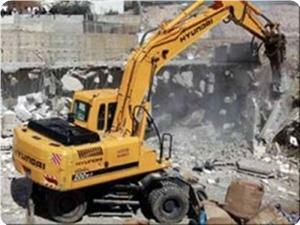 Daraghmeh told PNN that the council informed the local, legal, and human rights institutions of the demolition orders. He added that the owners of the threatened houses are in possession of the Taboo and legal documents that affirms their ownership of the property and that they plan to appeal to Israeli courts to cancel the demolition orders. 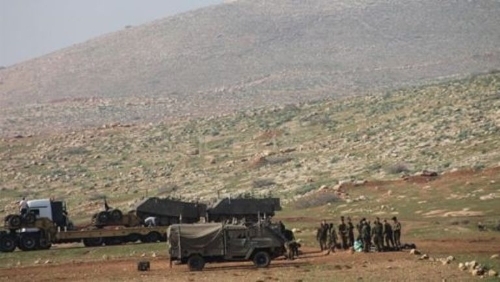 The Israeli Occupation Forces (IOF) have stormed on Monday al-Mantar area in the northern Jordan Valley where they handed over six demolition notifications against Palestinian facilities, as part of the Israeli policy that targets the Jordan Valley. 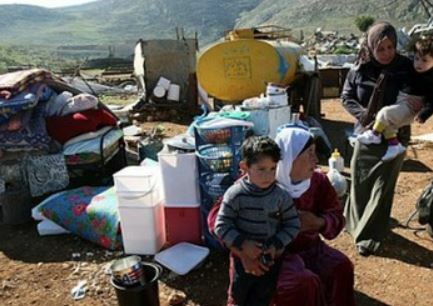 Aref Daraghmeh, head of Al-Maleh village council, said that the IOF raided al-Mantar area west of Nablus and handed over notification to six Palestinian families to evacuate and demolish a number of facilities on November 11. 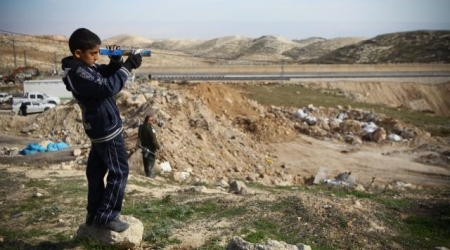 Local sources revealed that the IOF threatened the residents living in al-Mantar area with collective punishment in case they used the water passing through lines to the Israeli neighboring settlements. The Israeli authorities aim at evacuating the Palestinian population living in the area in favor of the Israeli agricultural settlements. The notifications came as part of the Israeli scheme to dislocate Palestinians living in Bedouin communities in the Jordan Valley. 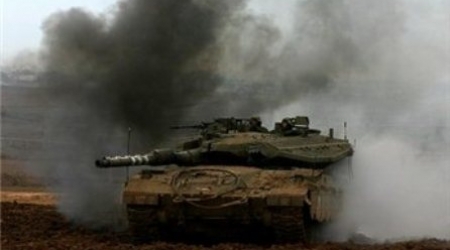 Israeli occupation forces (IOF) raided northern Gaza Strip on Monday morning amidst intensive random firing. A field observer said that IOF troops in armored vehicles escorted bulldozers into Burat Abu Samra area to the north west of Beit Lahia town. He said that the soldiers bulldozed the area and opened intermittent firing during the raid. The incursion is the latest in a series of breaches to the calm agreement concluded in November 2012 under Egyptian patronage. Seven Palestinians were killed while dozens were wounded or arrested in those breaches. Israeli soldiers kidnapped, on Monday at dawn and on Sunday night after midnight, five Palestinians in the occupied West Bank, and in occupied East Jerusalem. 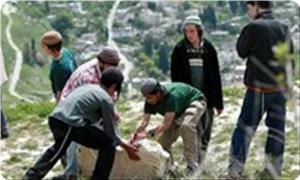 Settlers invade village in Hebron. Local sources in Bethlehem have reported that dozens of soldiers invaded the Deheisha refugee camp, south of the city, broke into the home of Mohammad Al-Khamour before violently searching it and ransacking its property, and kidnapped his son Ibrahim, 18. Dozens of soldiers also invaded Ya’bod town, southwest of the northern West Bank city of Jenin, and kidnapped on Palestinian. Local sources in the town said that the soldiers violently broke into the home of Abdul-Karim Atatra, and kidnapped his son, Abdul-Karim, 21. 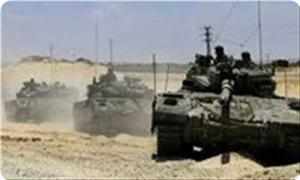 The sources added that the soldiers forced the family out of their home for several hours, and ransacked the property. On Sunday night after midnight, soldiers ambushed a number of Palestinians close to the Annexation Wall, in Abu Dis town in occupied East Jerusalem, and kidnapped two Palestinian. The two have been identified as Abdul-Aziz Mohammad Bader, 20, and Mo’sab Ahmad Bader, 21. 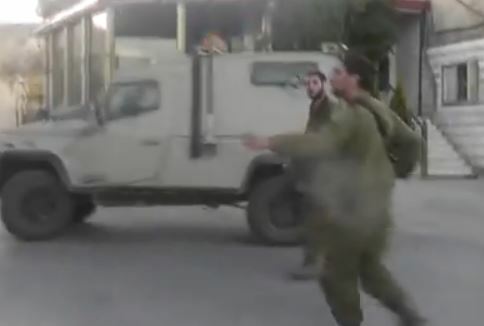 On Sunday evening, dozens of Israeli soldiers and extremist settlers invaded the Tiwani village, east of Yatta, near the southern West Bank city of Hebron, and attacked several residents. 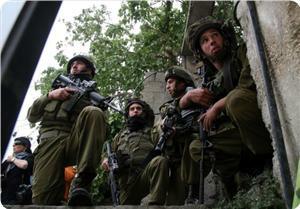 Eyewitnesses said that the soldiers broke into and searched a number of homes, and assaulted the families. They added that the army also fired several flares over different parts of the village, causing several residents, mainly children, to suffer anxiety attacks. The attack comes a few days after the army destroyed Khirbit Makhoul Bedouin village, in the area, for the fourth time within two weeks. Talab al-Sani'a, head of the Arab Democratic Party in the 1948 Palestine, said the situation of Palestinians in the 1948 territories has worsened since the Al-Aqsa Intifada in 2000. He stressed that the Israeli aggression against the Arab citizens inside the Green Line has increased. Sani'a told Quds Press on Saturday that the Israeli practices against the Palestinians in the 1948 territories, especially the violation of their fundamental rights, are paving the way for the outbreak of a new Intifada. The former MK pointed out that in case the Israeli government decided to proceed with its plans to displace the Arab citizens from their lands, a new Intifada will break out in the 1948 Palestine. He added that a lot of indicators show that the Palestinians in the occupied territories are on the threshold of a new wave of anger which may turn into permanent confrontations that will be more severe and longer than the confrontations that erupted earlier. The Israeli Occupation Forces (IOF) handed over notifications to Palestinian citizens in Ouja town, near Jericho, to evacuate and demolish a number of facilities by the end of October. Local sources revealed that the demolition notifications, distributed on Thursday, include sheds, tin houses, and houses under construction. Israeli occupation forces detained around 30 members of the Salhab family that resides near the illegal settlement of Beit Hagai, south of Hebron, under the pretext that Israeli soldiers were exposed to stone-throwing. Ahmed Salhab, a family member, said that military forces came in three military jeeps, surrounded the house, broke into it and forced all the family members outside. Salhab also said that a fight erupted between the family members and Israeli troops after the family protested against the IOF harrassment and breaking into their house without giving reasonable reasons. He added, Israeli officials banned his family members from video taping the incident. Israeli army claimed that its troops were exposed to stone-throwing near the vicinity of the settlement and that a surveillance camera had documented the incident. Salhab considers the provocative raids of Palestinian homes as part of Israel's policy to expel the families from their homes in order to seize land and increase illegal settlements in the West Bank. A number of fundamentalist Israeli settles burnt a Palestinian grapevine in the Al-Bweira area, near the Kharseena illegal settlement, in Hebron, in the southern part of the occupied West Bank. Local sources have reported that the settlers burnt four Dunams (0.98 Acres) planted with grapes, that belong to resident Mousa Abdul-Mon’em Jaber, and that the fire completely consumed them. He said that this attack is not the first, and that several residents have been subject to similar and frequent attacks carried out by extremist Israeli settlers in the area. Late on Wednesday at night, extremist settlers closed the west entrance of Ya’bod village, near the northern West Bank city of Jenin, and attacked several residents. 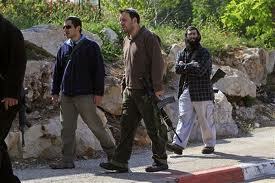 Israeli soldiers arrived at the scene, and invaded the village instead of removing the settlers. 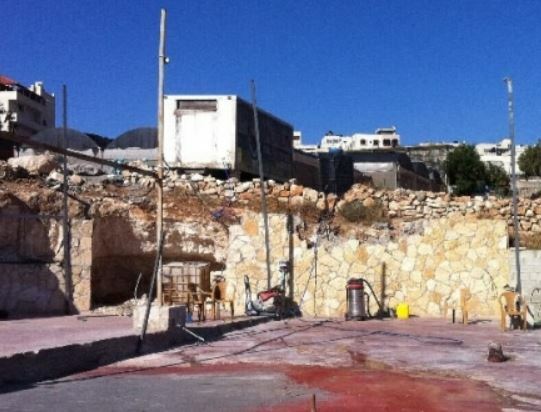 Earlier on Wednesday, a number of extremist Israeli settlers attacked and destroyed a car wash facility that belongs to a resident in Nabi Samuel village, northwest of occupied East Jerusalem. The attack is the fourth of its kind in two months. The ceiling of the house of Fares Salaymeh which is located in Al-Qirmi neighbourhood in the old city of Jerusalem collapsed on Thursday. Fares’ wife was surprised when part of the ceiling in one of the rooms collapsed; note that eleven people live in the house. 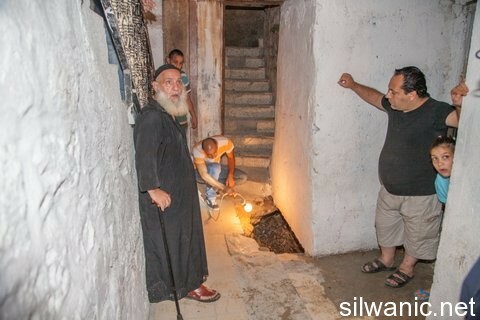 Several collapses and cracks occurred in the houses in Al-Qirmi neighbourhood during last month due to the Israeli excavations underneath the neighbourhood, in addition to lack of renovation of the water pipelines by the Israeli “Gihon” company. Locals condemned the lack of interest in the neighbourhood by the Construction Committees despite the locals’ appeals for the past five years. Jamal Assaily said that continuous excavation works are being done underneath his house which is located near Al-Silsileh gate which is one of Al-Aqsa Mosque gates. Assaily explained that the works began at 4 a.m. and are still going on, and it is obvious that the works are being done using heavy equipment noting that “Ateret Cohanim” settlement organization is carrying out those works as they are digging tunnels underneath the old city of Jerusalem. He pointed out that there were two collapses in Hosh Assaily last year and the year before because of the excavations and tunnels. Israeli bulldozers demolished the Jordan Valley village of Makhoul for the fourth time overnight Wednesday, a local official said. Aref Daraghmeh, the mayor of al-Maleh and the Bedouin dwellings, told Ma'an that Israeli military forces arrived in the area at 2 a.m. and seized two large tents and demolished several structures. 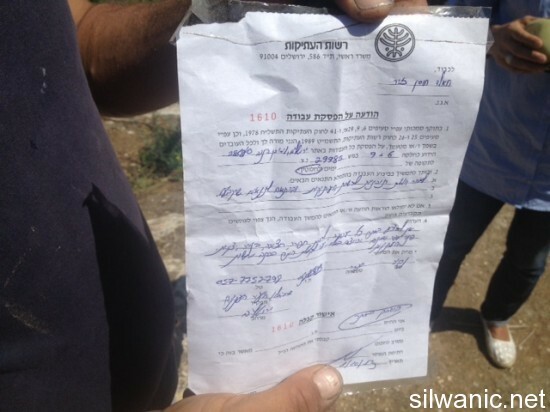 Israeli forces issued demolition orders for tents re-built by local and international activists and demanded to know why construction had taken place in the village. Israel's army destroyed the entire village of Makhoul on Sept. 16, forcibly displacing 10 families, including 16 children, the UN's Office for the Coordination of Humanitarian Affairs said. Despite being declared a closed military zone by Israel's military, activists have managed to enter the area and rebuild the structures destroyed by Israel. Days after the demolition, Israeli forces used force to disperse foreign diplomats distributing aid to residents of Makhoul. French diplomat Marion Fesneau-Castaing was dragged out of an aid truck by an Israeli soldier, who later confiscated the vehicle. EU foreign policy chief Catherine Ashton's spokesman demanded an explanation from Israel following the confiscation of humanitarian aid. 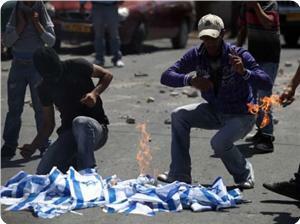 The Israeli military said Palestinians were to blame for instigating the incident. Israeli Haaretz Newspaper said in its Wednesday edition that since 1967, (Israel) has expropriated more than 20,000 dunams of Palestinian land, implying that there is no reason to build a national park. The newspaper said in an editorial article that the only answer to constructing the park was supplied last week by a staff member of the Nature and Parks Authority, who told visitors the main reason for the park’s establishment is to prevent construction. "Looking around, it’s easy to see whose construction the park is meant to prevent; to the south lies A-Tur, to the north, Issawiya. 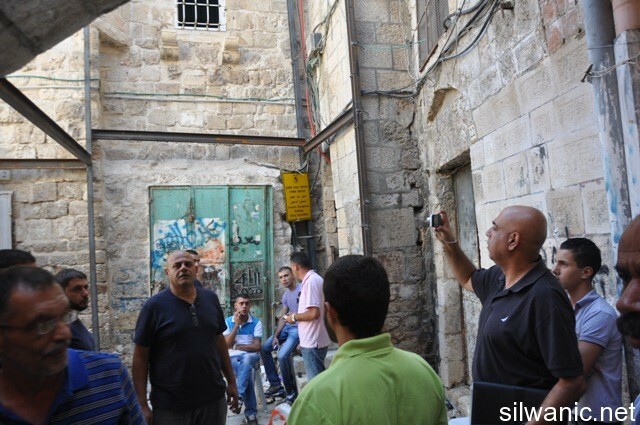 These two Palestinian neighborhoods, like most Arab neighborhoods, suffer from long-term neglect, overcrowding, absence of development plans, and illegal construction due to the fact that building permits simply aren't granted," it added. Such land was used to construct tens of thousands of apartments in the Jewish neighborhoods fronting the city on the east, according to the newspaper. It added that "During this period not even one new Palestinian neighborhood was built, while no effort was spared to stifle development in the existing ones." "The area allocated for the new national park is the proverbial poor man's lamb. It must be planned for the residents’ benefit while respecting nature and scenery," editor said. 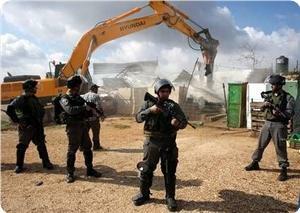 Israeli forces on Wednesday demolished a Palestinian home in the Negev, leaving 10 people homeless. Over 100 Israeli policemen arrived in the village of Wadi al-Niem accompanied by bulldozers and a helicopter, local committee head Lubad Abu Affash said. "It's as if they came to the village just to fight the people in the village, and they left after surrounding the area and demolishing the house," Abu Affash told Ma'an. The home belonged to Foad Ismael al-Jarjawi, leaving him, his wife and their eight children homeless. there is great resentment in the village. We did not refuse to negotiate with the Israeli authorities about the future of the village, but they treat us brutally," Abu Affash added. Palestinian member of the Knesset Talab Abu Arar said that this is the beginning of the Prawer Plan, even though it wasn't officially confirmed by the Israeli government. "If a Jewish man was taken out of his house because he didn't pay his rent, the Israeli authorities would provide a home for him, but for Arabs their houses are demolished and they're left out in the streets," he added. 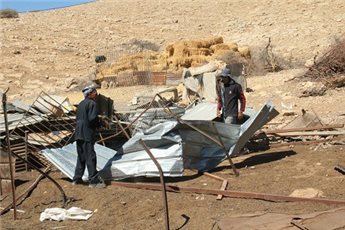 In August, Israeli forces destroyed three Palestinian homes in the Negev. The Israeli government in January approved the Prawer-Begin Bill, calling for the relocation of 30,000 - 40,000 Bedouin, the demolition of about 40 villages and the confiscation of more than 700,000 dunams of land in the Negev. 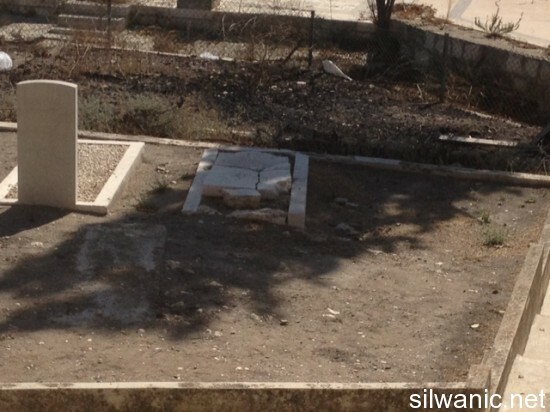 For the second time in two days, extremist Israeli settlers broke a gravestone in a Christian Cemetery that belongs to the Latin Patriarchate in occupied East Jerusalem. Extremists also slashed tires of six cars. 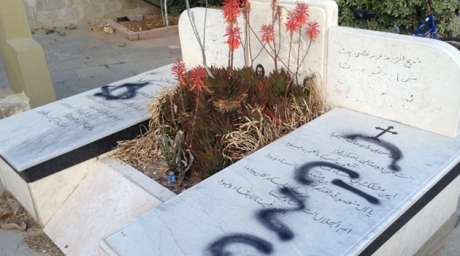 Resident Amjad Ka’mash, stated that dozens of settlers were celebrating in Nabi Daoud area, and later on, some of them infiltrated into the area, destroyed Christian gravestone, and wrote racist graffiti, such as “Revenge”, and “Price Tag”, on a number of walls and cars. He added that the settlers slashed tires of six cars that belong to the Palestinian families of Zanada, Halaby and Olewaat, in addition to slashing tires of a car that belongs to an Israeli guard working in the Boraq Wall area. Ka’mash further stated that the attack was caught by surveillance cameras, and added that local residents noticed the settlers, and chased them away. 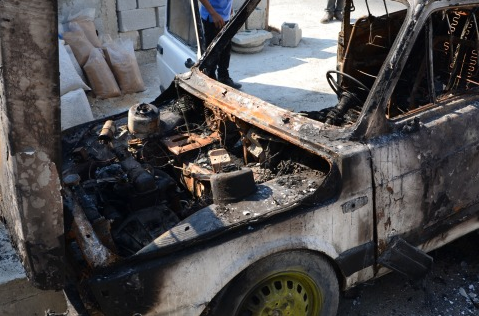 Jawad Siyam, head of the Wadi Hilweh Information Center, in Silwan, stated that the land where the attack took place belongs to the Latin Patriarchate, and is used as a parking lot for residents and visitors of the neighborhood. Describing it as cowardice, Father Firas Hijazin slammed the attack, and said that extremist Israelis repeatedly attacked Christian sites in the occupied territories, and denounced the inaction on the part of the Israeli police. On Sunday [September 29, 2013] a number of Israeli extremists invaded a Christian Cemetery in occupied Jerusalem, and destroyed 15 gravestones before Israeli police officers chased, and apprehended them. Nearly a week ago, Price Tag graffiti was also found on the outer walls of a Church in the Old City of Jerusalem. 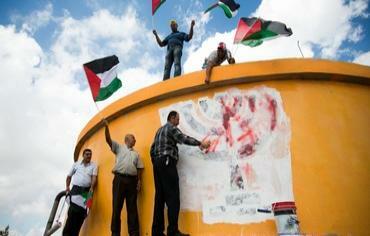 Settlers also punctured tires of 28 Palestinian cars, and wrote racist graffiti in Abu Ghosh. Dozens of activists have managed on Monday to re-build Khirbet Makhoul despite the Israeli military restrictions on the area after being demolished three times in the past two weeks. The activists have set-up tents in Khirbet Makhoul in Wadi al-Maleh northern Jordan Valley challenging the Israeli decision that declared the area a closed military zone, eyewitnesses said. The sources told PIC reporter that the activists managed to break the curfew and the Israeli decision, stressing that they will not leave the Palestinian land. The activists confirmed that they will build Khirbet Makhoul repeatedly and continuously in case it is demolished again by the Israeli forces. The Israeli forces raided the land of Khaled Al-Zeer on Tuesday which is located in Al-Abbasyeh neighborhood in the town of Silwan, and hung an order from the “monuments police” to stop the construction and renovation works in the land. 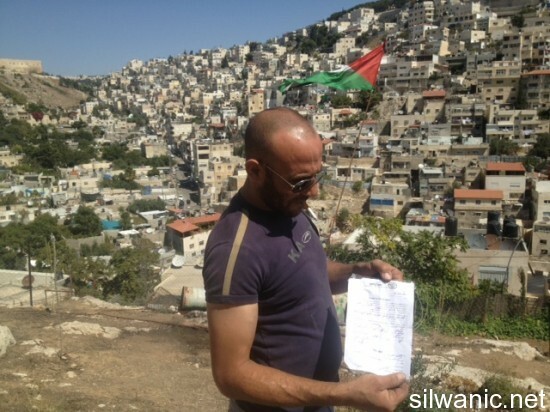 Khaled explained that the forces raided his land where he and his family live inside a small cave after the Nature and Parks Authority bulldozers demolished his house on the 20th of last August, and hung an order to stop all kinds of works. Al-Zeer pointed out that his family that consists of 7 members (him, his wife and five children) live in the cave that lacks the simplest requirement and facilities as it does not have a restroom and his family members are forced to go to his father’s house across the street to use the restroom, and the kitchen only has a small stove and the “cave” consists of one room that is used for sitting, sleeping and as a guestroom. Al-Zeer condemned the Arab and Muslim terrible silence of what is happening in Jerusalem, demolitions and confiscation and raids of Al-Aqsa Mosque and considered it a “betrayal” to the Palestinian people. Palestinians in the Jordan Valley have petitioned the High Court of Justice to have their land between the border fence and Jordanian border returned, and to have the settlers cultivating dates there removed. In January, a Civil Administration document confirmed that over the past 20 years, under the military order barring Palestinians from entering the area, more than 5,000 dunams (1,250 acres) belonging to Palestinians had been awarded to settlers. In some places the border fence is up to two kilometers from the Jordan River. the time, Amram Mitzna. 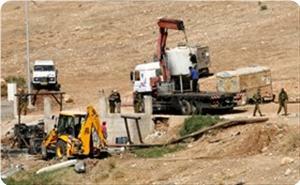 The WZO leased the land to the settlers; the government hoped to create a kind of buffer zone along the border. The land was cultivated by Palestinians even after the Six-Day War. They were banished in 1969 after Palestinians began trying to return to the area from Jordan. Before January, the Palestinians had not realized that others were cultivating the land. Heirs of three landowners petitioned the High Court via attorney Wissam George Asmar. The petitioners are also requesting an interim order that will halt the current cultivation of the site by the settlers. Justice Uri Shoham gave the state 21 days to respond. 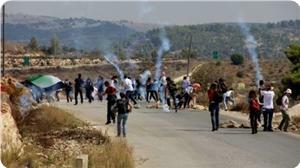 Inhabitants of Sarta village in Salfit clashed with Jewish settlers who trespassed their land and annexed part of it. Local sources said that the settlers have been working on building a new road linking Brukhin settlement to nearby settlements for the past three days. They said that the road was passing through Sarta village land and annexed a big chunk of it, adding that settlers had intensified their presence in the village land by Thursday night. They said that confrontations broke out again after Friday congregation and Israeli occupation forces backed the settlers. Eyewitnesses said that IOF armored vehicles and bulldozers were seen at the outskirts of the village in preparation for resuming work in building the road despite the inhabitants’ protests. A Palestinian activist specialized in affairs of the occupied city of Jerusalem said the settlement activities in the city have significantly escalated since the resumption of Israeli-Palestinian negotiations about two months ago under U.S. auspices. The activist Rasim Obeidat pointed that the settlement activity in occupied Jerusalem has been escalated, adding that the occupation approved the construction of thousands of settlement units in addition to the increased number of settlement projects that are approved by the Israeli authorities. He told Quds Press that "these projects are being approved publicly, and the Palestinian Authority knows about it... We are witnessing in Jerusalem the construction processes on the ground. It is no longer a secret." 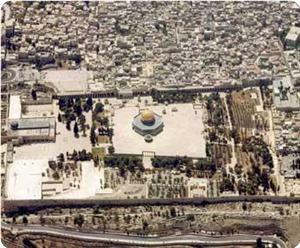 Obeidat pointed out that the settlement activity is concentrated in the Arab neighborhoods in Jerusalem, according to a scheme that aim to separate these neighborhoods from each other and to prevent territorial contiguity between the Jerusalemites. He confirmed that the occupation authorities have approved the construction of 4,000 housing units in many Palestinian towns and neighborhoods in the eastern part of occupied Jerusalem, since the return to negotiations. The Palestinian activist warned that the occupation authorities, in light of the negotiations, are working on creating a new reality inside the Aqsa mosque, through the daily incursions of the settlers under the Israeli police protection, and the prevention of the Muslims from entering the mosque. He pointed out that the Jewish Yishai Society is planning to establish a synagogue on the one sixth of the space of ​​the Aqsa mosque, and stressed that Jerusalem is exposed to a comprehensive attack, even in the field of education. Obeidat condemned the state of silence by the Arabs, Muslims and Palestinians vis-a-vis the Israeli violations in occupied Jerusalem, and called for developing an Arab and Islamic comprehensive strategy to save the city. The Euro-Mediterranean Observatory for Human Rights said that about 33% of the Jerusalemite houses are threatened with demolition due to unlicensed construction. The Observatory stressed in a report on Thursday that Israel is continuing its demographic war on Palestinians, as it allocates for their natural expansion less than 13% of the area of ​​East Jerusalem, which has created a real disaster. It pointed out that the settlement activity has been escalated, as the Finance Committee in the Jerusalem Municipality approved financial support for 1,500 new housing units at the end of last August, while in the same month the Israeli bulldozers began demolition operations in the neighborhood of al-Tur in preparation for the construction of a Jewish national park. The report said that the United Nations figures reveal an increase in poverty rates in Jerusalem from 64% in 2006 to 78% in 2012, due to the high unemployment rates which exceeded 40%, in addition to the blatant discrimination in wages between Palestinian and Jewish workers. It called for exerting pressure on Israel to compel it to immediately freeze the settlement activity in East Jerusalem, as well as protecting the Palestinian sovereignty over East Jerusalem and strengthening its position as the capital of a future Palestinian state. A group of Jewish settlers installed a container and tents in an area west of Abu Dis in occupied Jerusalem on Tuesday night. 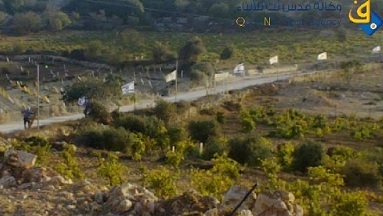 Settlers hoisted Israeli flags and danced and reveled to celebrate annexing this area, called Jabal, which is located beyond the separation wall. The Israeli civil administration department had announced confiscation of this area after claiming it “state land” while in fact hundreds of Palestinian Bedouins live in it, but the Israeli occupation authorities plan to dislocate them and transfer them to other areas. Lawyer Bassam Bahar, who is heading a committee to defend Abu Dis land, described the act in a press release as “very serious”. He said that the step aims at confiscating thousands of dunums owned by Abu Dis inhabitants, adding that the new settlement outpost is part of the Judaization scheme of Jerusalem.